This is Yuki if you know me! I came back from Japan last week. It was whole three weeks I spent there. Seeing my friends, family and dog (I absolutely LOVE my dog)! It was all sooo good!! I meant to take loads of photos of Japanese cuteness there, but my bad. I was too busy catching up with my friends and stuff, I hardly took any…. These are the few photos I took in Tokyo. They were so cute that I had to show you! 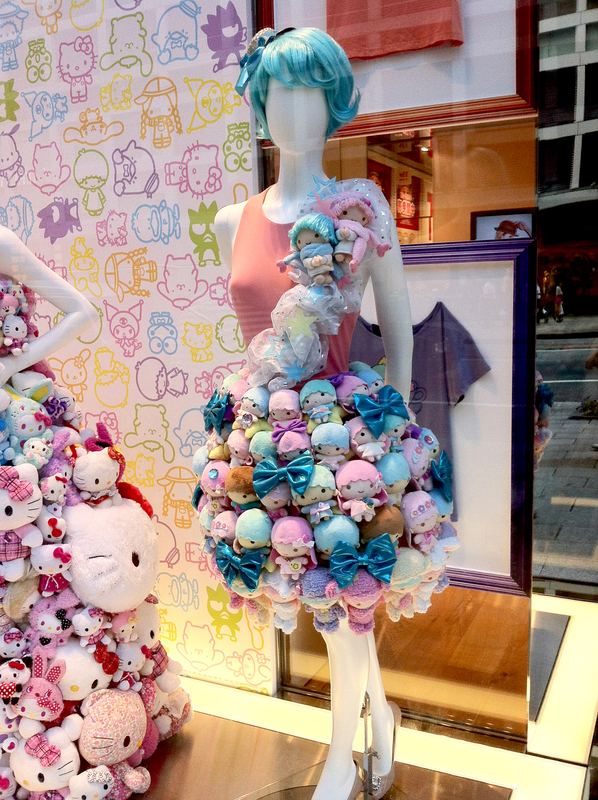 It was Uniqlo’s window display. When I saw these, I really felt back in my county!! Love for craziness and cuteness. 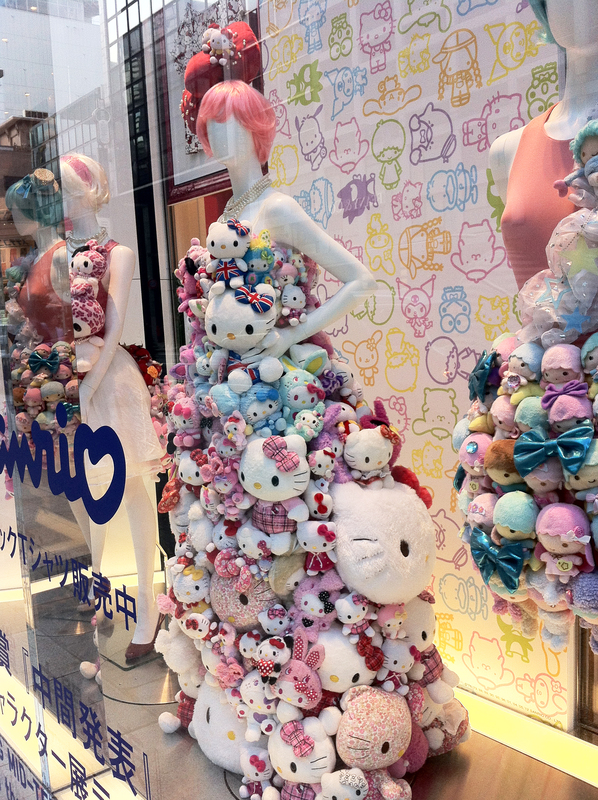 Can you see there are a few Union Jack Hello kitty too? How crazy and cute are they!! It was in a place called Ginza in Tokyo and it’s a very very busy place. I had to stop in the middle of street (must have been super annoying to others) and looked like a tourist in my own country! Ha! You might be mad at me because I didn’t take more photos but I think you’ll have to forgive me if I tell you I brought some gifts back. We are thinking about how to give them so I’ll let you know as soon as we decided. As for now, I can tell you that Maccha (Green tea) Kit Kat is one of my souvenir from Japan. See? Now you must love me? Win a trip to Japan!! I noticed my entry “Want to go to Japan? For Free? ?” was quite popular. And nothing can beat “free holidays”, right? I just found this great offer and had to share it with you. Do you have soy sauce in your kitchen? As a Japanese, I can’t live without soy sauce. I mean it. I’m pretty sure many people have seen this brand before? 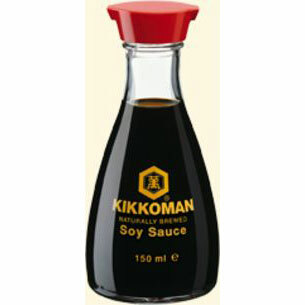 Kikkoman soy sauce. I’ve got one in my fridge. 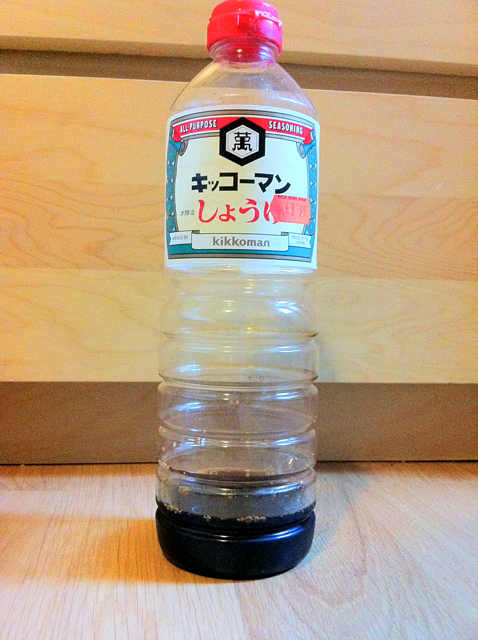 This is Kikkoman soy sauce Japanese version, £3.99 for 1litre. (from “Rice wine shop” ) I know it’s running out!! So the deal is that you need to make a short video or animation to show how Kikkoman inspired you! I’m going to Japan in two weeks time! My summer holiday! Can not wait!! I’ll try get some souvenir for you. We’re thinking of some give away maybe? We’ll let you know as soon as we know for sure! How was the bank holiday weekend?? Did you go to central London to see the queen? Yet I liked the festive atmosphere very much. I like it when everyone shares happy mood for something, like this Diamond Jubilee, Olympics or FIFA world cup (even though I don’t know anything about football)! Especially in London, you see almost every nationalities and when most of them are happy for whatever it is, it just feels great. My Korean friend has been staying in London for a while and she gave me a gift. Don’t have a heart attack! They are so cute!! They are tinted lip balms. Don’t you just love them? They are not only cute but really moisturising and gives a pretty peachy tint. 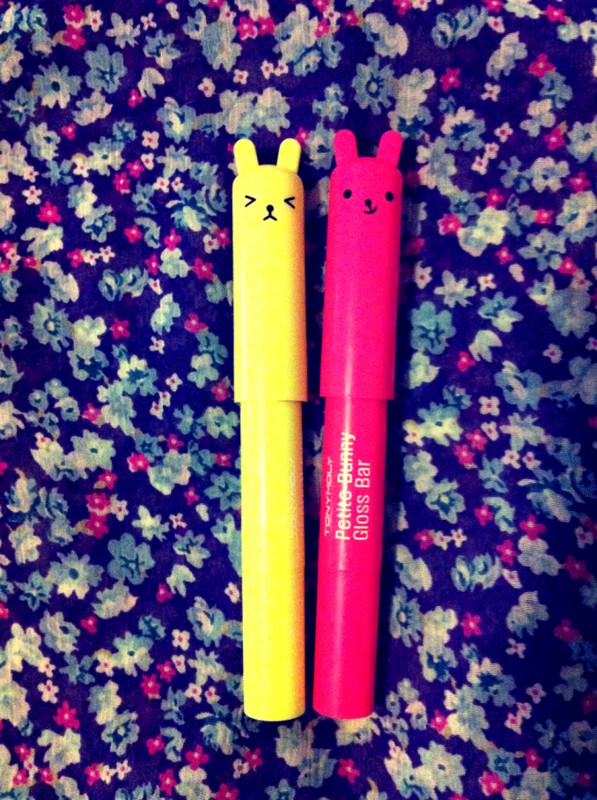 Now they are my “can’t live without” cosmetics. Sorry I’m not sure if you can buy them in Europe. Check their website or google “Tonymoly”. I just showed off today, didn’t I? Well, I wanted to share!! I believe there’s a big difference between two. Let’s talk about Japanese films today! Do you like films? I love films. How much? Hmm, I might be able to live without music if I had to but not films. I watch both Japanese and non-Japanese films but I am going to write about Japanese films here. I am sure you don’t need me to tell you what American films are good, right? I know it’s me who chose this topic but it is a very tough one. The most difficult question that someone could possibly ask me is “what’s your favourite film?”. You know what I mean? I can not choose one!! However there are a lot of films which don’t seem that many people know about and I want to introduce them here. I picked up one of my favourite films today. I don’t think this is well known film in this country and I personally think this film has been underrated. I love looking around in Fopp (DVD/CD shop) in Covent Garden. They have lots of good but minor foreign films with good deals. I don’t think they even have copies of the film. In fact I have never seen a copy of this in any shops in London. You can buy it online though. Anyway the film is beautiful visually and emotionally. It is a cute teenage girl’s film but not only cute but also little bitter in a way. 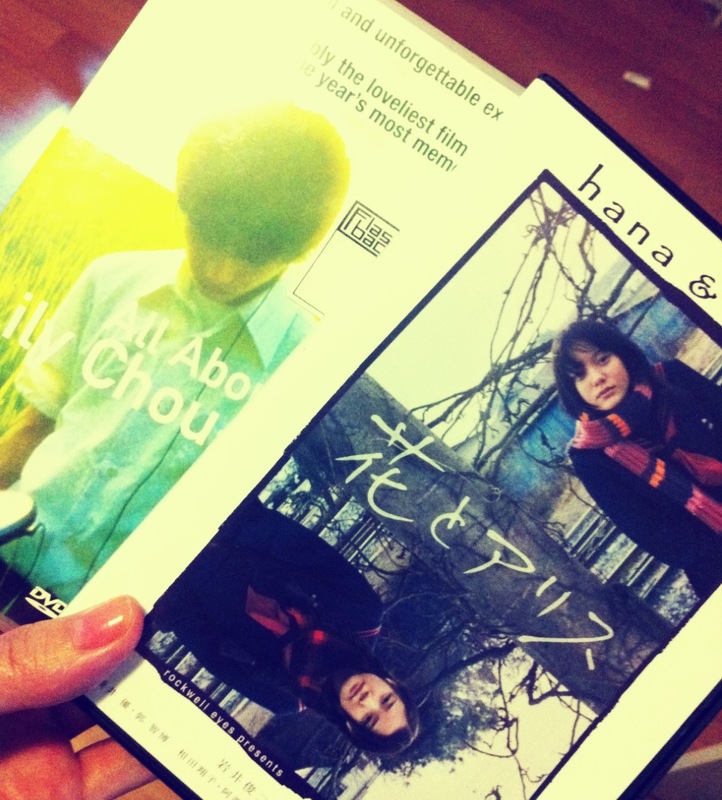 The director is Shunji Iwai, from “All about Lily Chou-chou”. I think he is a master of colours on a screen. I can’t describe it well (even in Japanese) but the colour and atmosphere are just very beautiful and makes you a little bit sad. In this way Hana and Alice is a bit similar to “The Virgin Suicides“. Some might say it’s a bit slow film but it can be funny sometime. Maybe a bit surreal which I always like! I don’t know if this film is one of the films that only Japanese people find good or it’s just because not a single company tried to promote this film in this country. I love this film so much I have a copy of it. I know it doesn’t mean much here but in Japan DVDs are very expensive. I must have paid more than £35 for this!!! This is my copy. The left one is All about Lily Chou-Chou. Was only £5 here in London. I would really love to hear your opinion if you have ever watched it! How has your Easter weekend been so far?? I had a good night out with my friends on Thursday and a lovely day with my Japanese friend today. We talked about what we can and can not say in English. It’s actually a kind of funny topic. For example, people say “Cheers” all the time. Our question was whether it sounds a bit weird or unnatural for us to say that. We are not native English speakers and you can tell straight away from our accent and appearance. We are still learning English everyday and we pick up a lot of vocabularies and expressions from our everyday life. Something like “cheers, mate” is always there. You hear it all the time. You pick it up and then want to use it. Copying native speakers is always a great way to master another language, definitely. But me saying “cheers mate” is a bit too much, I think. I mean I wouldn’t actually say that. No. But maybe “cheers” is fine. The thing is that it is impossible for us to tell if that sounds okay or not. My husband is a native English speaker and he told us that it is not weird at all for us to say “cheers” but it might sound like we are trying too hard if we said “innit”. It’s only his opinion and it really depends who says it, how you says it or when you says it. It is just one silly example but what I want to say is that there is no definite rules or text books to tell us “you can say “cheers” but maybe you don’t want to say “innit” with Japanese accent”. Am I explaining it well? Hope you know what I am trying to say. It is always a big topic for me to understand that kind of thing and I am sure if you are living in a country where people speak a different language to your mother tongue. You want to speak their language better just in order to communicate but at the same time you don’t want to sound too unnatural. Or is it only me?! Anyway, enough of my silly English issue. Right. Tomorrow is the day!! We are having a stall at Capel Manor Gardens tomorrow. From 11 am to 16pm. The prices for all the products are lower than eBay!! Yay!! It is an Easter Egg Hunt event. Please come along and have a look at our lovely stuff!!! Really looking forward to seeing you!! Good night and Happy Easter everyone! I know it is absolutely nothing to do with our shop but did you watch “The Apprentice” last night? It was the first episode of new season. I love The Apprentice. I guess this programme is the only one I never miss. I’ve watched all seasons and my favourite character out of all has to be Tom, the winner of last year. I think he was the only person who never came across as aggressive or “just too much”. I loved the way he always raise his hand to say something!! This programme can be VERY annoying sometimes because everyone has a very strong personality and is so self-confident, which are not always bad things. As a matter of fact, it seems to be very important features to have in order to win the competition. As a Japanese, we were taught to be modest so that some people on the show really make me cringe. The cultural difference or nationality plays a crucial role in this competition I think. Not in a racist way but every countries has their own way to do business and different concepts of politeness. I personally think Japanese people and British people have something in common when it comes to be diplomatic and polite. But I can NOT imagine a Japanese person comes to the show and win! Not in millions years!! It’s not that Japanese people don’t deserve it but you really have to be self-confident and have to push and sell yourself in front of the public and everything! I don’t think that’s very Japanese. But this is just my opinion and there are so many Japanese people (127,450,459 in 2010) that someone might be able to do it and I’d love to see some Japanese person winning on The Apprentice. Wow, that would be amazing. I am looking forward to finding my favourite character from new season! Have you already found one? 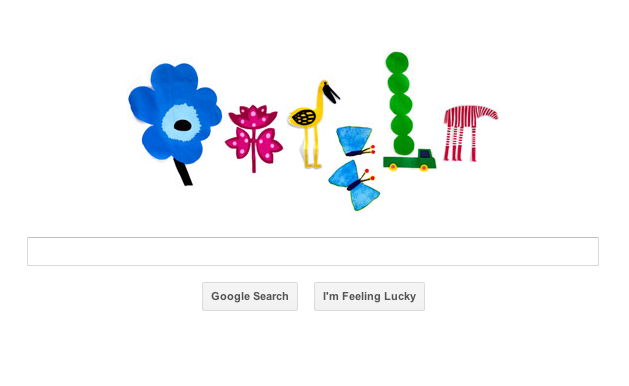 The first thing I opened Google Chrome this morning and saw was this. The design is by Marimekko. I love Marimekko!! They design very beautiful patterns and pretty stuff. Even my duvet cover has their signature flower print. I love it. So it’s official now!! Spring has come!!! Woo hoo!! I love spring. I love it even more since I started living in London. I am from a place called Sapporo in Japan, which is up North and can get SERIOUSLY cold. We have lots of snow in winter. Because of that, people say “you are from Sapporo you should be fine with English winter!” The answer is no. An absolute NO from me. I don’t know if I make sense but it really is true that once snow settles down, it doesn’t feel that cold? The temperature can get as low as 18 degrees. Oh, that’s minus buy the way. Yes that sounds serious, right? Of course it is very cold there. However it somehow feels much tougher here in London for me. It is very windy and no snow. Looks like the same as autumn but MUCH colder. Oh no, just thinking about it make me shiver. Maybe one day I’ll get used to it, maybe…. Anyway, spring is good. More colours in the scenery, warmer and more energy!! At the same time, Spring is the toughest time to resist shopping for clothes. Just so many colourful and light clothes in the shops and you are still wearing those darker and thicker tops from winter. You feel like “YES! It’s time to buy new clothes because it is spring now!”, but hey, it’s not a bad thing girls! We can justify ourselves for a few new pieces of clothes. Also don’t forget to check our website for your new spring stationery too! If you are in London, enjoy the sun today and have a nice day everyone in the world too! !